John Carpenter’s 1978 horror film Halloween is so compelling that even after a thousand sequels (okay, nine or ten, depending on how much hairsplitting you want to do), a wowed public will still pay to see this new revved-up 2018 homage in theaters. Executive produced by Carpenter, who actively collaborated on the production with writers Jeff Fradley, Danny McBride, and writer-director David Gordon Green — I know, weird, right? All these comedians doing horror — the film includes many direct recreations of Carpenter’s memorably scary shots, such as the agonized face of Laurie Strode (Jamie Lee Curtis, wonderfully seared by age) leaning against the doorframe, waiting for Michael Myers to emerge and attack. There are also some quietly inspired new effects, like the scene featuring motion sensor lights that keep getting tripped in a dark suburban backyard on Halloween night, with each successive floodlight burst showing Michael Myers standing still, but twenty feet closer to his teenage prey. Plot-wise, all you need to know is that forty years after his youthful killing spree, the elderly, institutionalized Michael Myers breaks out for a long-awaited rematch with hard-bitten, locked-and-loaded senior citizen Laurie Strode. Intermediate sequels, with their extravagant plot elaborations, are ignored or knowingly mocked. Michael’s total alienation from the society around him has always made him a source of identification and even affection. In short, he’s a good monster. His mute, dead-eyed stare through the mask eyeholes is eloquent in its own way. The mean streets of our own cities and towns often seem to warrant just such a stare, yet at the same time, to share the point of view of a character who is the object of Michael’s stare from across the street creates a reliable feeling of black dread. We seem willing to watch Michael endlessly, walking down streets crowded with trick-or-treating kids and ranging through middle-class homes where clueless suburbanites neglect to turn around in time to save themselves. Has any lone movie monster ever spent so much time out and about in full public view? In this version, the filmmakers even add a daytime rampage through a fully operational gas station, with Michael lethally blending in by wearing a worker’s stolen denim overalls and heavy boots. The filmmakers address the central mystery of Michael Myers’ gruesome appeal, opening the movie with earnestly self-righteous reporters on a quest to try to make him explain himself. It’s a stupid quest, the audience knows, but the reporters seem to be operating in the context of our incel-infested, neo-fascist creepshow of a culture, in which self-pitying white guys never stop talking and posting about their endless grievances and supposedly justified acts of mayhem. The reporters get access to him in the high-security asylum where Michael and the other inmates get their fresh air chained within small separated squares that are part of a large menacing red-and-white checkerboard-patterned outdoor holding pen. It’s a madly overdone production design, like something hallucinatory out of the old art-house head-trip Last Year at Marienbad. One of the weaknesses of this new Halloween is that director David Gordon Green (Pineapple Express, Eastbound and Down) seems so excited to be working on a Halloween tribute he can’t leave anything alone. He fills so many shots with tricky lighting effects and slick reflected images and elaborate re-stagings of old Carpenter shots that it makes you realize what a quiet, stripped-down masterwork of horror the 1978 Halloween really was. Still, the remake has an agitated energy that spooks the audience nicely. Look out for the scene with the father and son driving through the woods at night, the poor kid just wanting to get to his dance class. 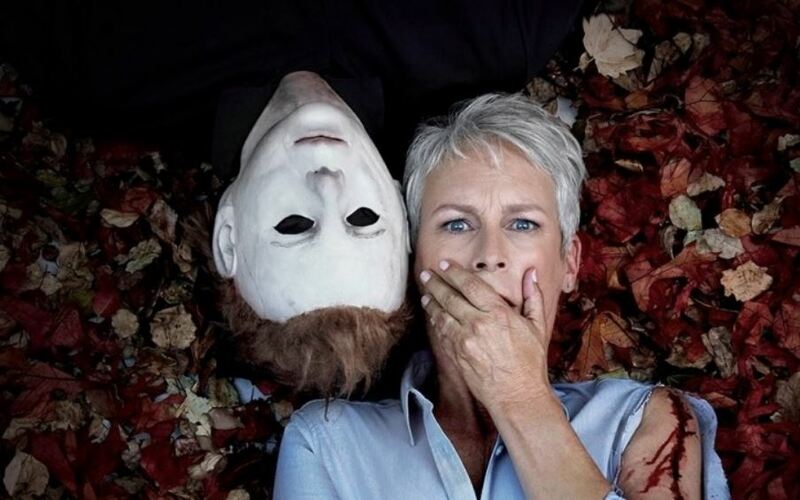 The new Halloween has certain dark charms, such as Michael’s mask, now symbolically seamed and marked with age. The reporters bring it with them to shame the legendary killer, who’s now gray-haired, but tall and silent as ever. Michael never turns around to acknowledge the appeal. The film flirts repeatedly with the possibility of showing Michael as an everyday killer by revealing his face without the mask, or his voice describing his motivations, as if he were a featured real-life inmate on YouTube’s Confessions of a Serial Killer. “Why won’t you speak?” is the pleading heart’s cry of Michael Myer’s obsessed psychiatrist, Dr. Sartain (Haluk Bilginer), expressing the wish of no Halloween fan ever. “Oh, you’re the new Loomis,” says Laurie Strode contemptuously to this latest idiotic shrink in the franchise who’s writing his own death warrant by trying to save Michael Myers for further study. Laurie is now a grim, gray-haired doomsday prepper who knows her doom by name and awaits the final showdown with Michael in her rural home-fortress (complete with a basement-level panic room and mini-arsenal). It’s good to see that Jamie Lee Curtis can still bring it with the same dead-serious ferocity as when she was a young unknown playing Laurie Strode in her 1978 film debut. To her estranged family, Strode is an embarrassment — a monomaniacal alcoholic who has wasted her life on a paranoid vision of the world. Of course, in horror films, the paranoid version of the world is the correct one. Therefore, even if there’s a reactionary effect in seeing confirmed the fever dreams of an apparently loony suburbanite stockpiling guns, it’s also highly satisfying in genre terms to watch Curtis’ steely-eyed ranting get proved right. Curtis represents the seemingly deranged aspects of the character without vanity or apparent make-up, her long face harshly lined, her thin mouth as severe as the scar from an old knife wound. As feminist film studies scholar Carol Clover famously argued in Men, Women, and Chainsaws: Gender in the Modern Horror Film, the Monster and the “Final Girl” in slasher films are united by qualities that set them apart from all the other characters, and allow audiences to identify equally with both killer and formidable, final intended victim. Of course, this Halloween’s Final Girl is no longer a virginal babysitter. “I’m twice divorced and a basket case,” she proclaims rather proudly, and Curtis’s moments of flinty self-assurance are her best in the film. Ultimately it will take three generations of Final Girls — Laurie, her daughter Karen (Judy Greer), and her granddaughter Allyson (Andi Matichak) — working together to deal with Myers’s onslaught. The director makes a risky choice in Greer, whose high-pitched eccentricity is effective in comedy (Arrested Development, Archer) but can be distracting when she seems to be playing it straight. Her character constantly bemoans her weapons-trained upbringing and rebukes her mother’s doomsday prophecies with vague twittering about “a world filled with peace and love and kindness,” but it’s clear throughout the film that somehow she must rediscover her inner gun-toting child. Frankly I doubted Greer would ever manage it convincingly, but I was wrong. She pivots on a dime with a timing that can’t be overpraised. Maybe there are certain benefits from having comedians do horror film (see Jordan Peele’s Get Out). So what the hell, for the seasonal thrill of it, see Halloween 2018. Then to honor John Carpenter as he deserves, see the truly great Halloween 1978 one more time!